← SAFE SOLAR Kick-off: Get the low-down on rooftop solar! 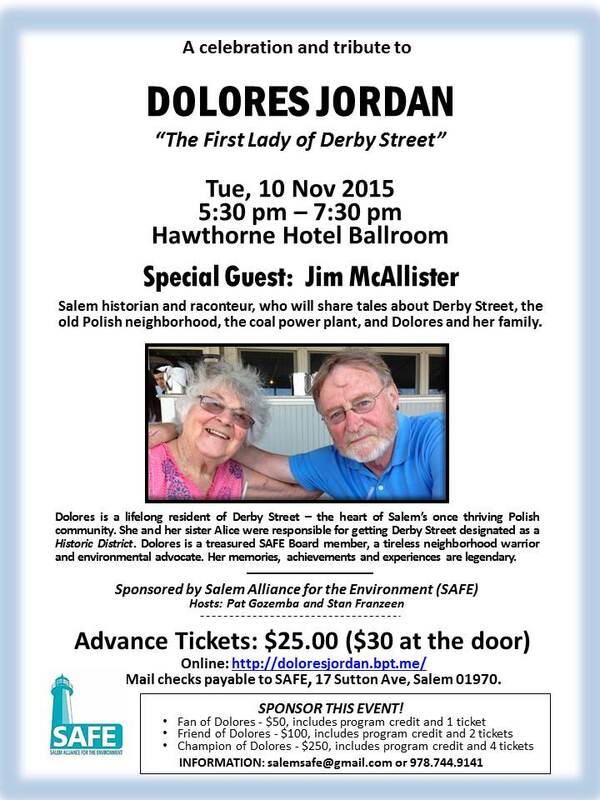 One of Salem’s most respected, enduring and passionate activists, Dolores Jordan, will be honored at a celebration and tribute to her life at the Hawthorne Hotel on Tuesday, November 10, from 5:30-7:30 pm. A lifelong resident of Derby Street, Jordan, who is turning 87 in November, will be recognized for her many decades of civic contributions. Noted legendary Salem historian Jim McAllister will emcee the event, and many public officials and local residents are expected to attend. Hors d’oeuvres will be available along with a cash bar. Bob Kendall will be on hand to provide musical accompaniment. Excess proceeds will go to SAFE, where Jordan has served on the Board of Directors since 2005. In addition to her work with SAFE, Jordan has been active with Salem Sound Coastwatch; HealthLink, Friends of Salem Woods; Clean Water Action; Greenpeace; and MASS PIRG. One of her primary goals was to stop the toxic pollution that was generated by Salem’s coal burning power plant. She was instrumental, along with her sister Alice (now deceased), in forming Concerned Citizens of Derby Street (later the Historic Derby Street Neighborhood Association), and she worked tirelessly to secure Historic District status for Derby Street in 1974. She received the Hawthorne Historic Preservation Award in 1998 and was awarded a commendation from the National Trust for Historic preservation. Ms. Jordan was particularly active in funding “Salem Sets Sail” an educational program for youth at the National Maritime Park. Since 2011, these funds have allowed all Salem fifth grade classes the opportunity to participate in a free educational program, Salem Sets Sail. In the last five years, over 2,000 of Salem’s schoolchildren have benefitted from Ms. Jordan’s generosity. Because of Ms. Jordan’s support, students have learned how Salem’s maritime community played a critical role in global trade and the establishment of the United States of America. Even more importantly, Salem Sets Sail transports Salem’s young people out on the water, where they take a turn at the tiller, raise sails, and navigate through Salem Sound. In a society where today’s youth face an array of challenges and are influenced by new technologies, Salem Sets Sail immerses them in the historic and natural world to which they are also a part – an experience they might not have otherwise. Ms. Jordan’s volunteer and civic career has also included work with the Peabody Essex Museum; the Salem Beautification Committee; the Alumni Committees of Boston University and Salem High School and fundraising and volunteer work with St. John the Baptist Parish in Salem and throughout the Polish community. Tickets are available to the general public for $25 in advance ($30 at the door) and may be purchased on-line at http://doloresjordan.bpt.me/. Or checks made payable to SAFE may be sent to SAFE, 17 Sutton Ave, Salem 01970. For more information: salemsafe@gmail.com or 978.744.9141. This entry was posted in City of Salem and tagged Salem Harbor Station. Bookmark the permalink.